I chose the pre-colored images to create this card. They are perfectly colored. I printed the onesie in pink and 3 of the safety pins in pink, yellow and blue. I hand-cut the onesie and used Spellbinder's classic circles to cut out the safety pins. I did a horizontal flip on the yellow safety pin so it would be facing the opposite direction. All of the card stock is Stampin' Up! (Whisper White, Pretty in Pink, Bashful Blue and Barely Banana). After using the circle die on the safety pins, and a larger die for the coordinating color of card stock, I used the coordinating ink in the center of the circles. I then layered them, popped them up, and then added coordinating crystals to each and then coordinating smaller crystals around the edge of the circle. The onesie was cut and layered on white card stock that was distressed with Barely Banana ink and then layered onto the designer paper that comes with the set and then once more onto Bashful Blue card stock. The white card stock base was also distressed with Barely Banana ink. The word "Angel" is a stamp from Gina K. Design's Wee Tee's set. I added a crystal at the collar and 3 silver pearls at the bottom to represent snaps on a onesie. There is still time for you to pop over to the Doodle Pantry Blog and play in our challenge. You will receive the Quirky Stork set just for playing along. If you are the winner, you will receive a gift certificate to use in the Doodle Pantry store. The challenge ends June 24th. This is wonderful Susan, love your colors and the baby pins as accessories is brilliant. Great card! Susan what a gorgeous layout! Beautiful colours, great baby card! Adorable - love the layout and the colors, and of course got to have a little bling. 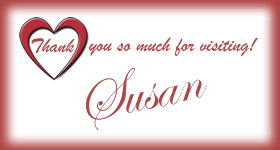 Awe this is lovely Susan . Thank you for joining us for our Through The Raftroom Door Challenge this time and GOOD LUCK.